Calling his paintings “a workout for the eye, the mind, and the body,”1 Plympton Wyoming, Ontario-based artist Gary Spearin acknowledges his drive to engage viewers in a process as demanding as the act of creation. 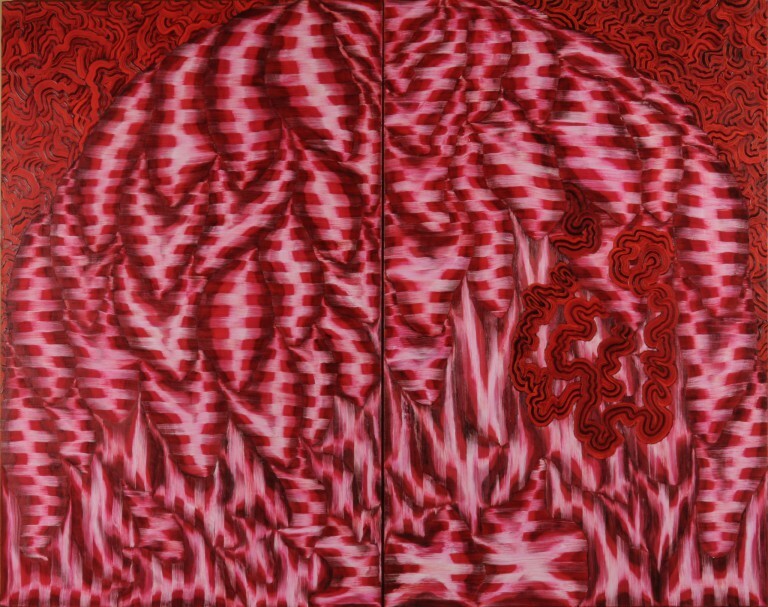 Spearin sets a daunting task for himself: to complete his paintings “ninety-five percent” in one go and to create variation from just “a few painting techniques.”Given these limitations, he demonstrates considerable resourcefulness when it comes to colour. Spearin acknowledges using “50-plus colour combinations” to produce the unique optical effects he is after. It is precisely these rules that make Spearin’s Rred series such a tour de force. Here, Spearin not only limits his techniques but also his palette. Variation must be achieved in other ways: format (as in the diptych format of Rreddwings) and in the rhythmic patterning of his ribbon-like forms. So energetic are the paintings’ optical vibrations that standing within an installation of Spearin’s Rred series can take viewers into a heightened state of awareness of both space and time. It is perhaps no surprise, then, that his installation iNifiNiTi (which appeared in several Canadian venues, including Museum London, from 2010 to 2012) took this experience one step further. In all his work, Spearin immerses the viewer in dizzying glimpses of a realm where time and space have no apparent endpoints, and where there are no limits to the interpretive act.